Le Champignon de Bruxelles started with Hadrien Velge, Sevan Holemans and Thibault Fastenakels. After reading some inspiring books, they discovered an emerging niche with an enormous potential to change the world for the good: the cultivation of mushrooms on organic waste sourced in cities. Without asking too much questions, they embarked on an adventure and went from young students to being successful entrepreneurs. It is time to say goodbye to our linear economic model of “take, make & dispose”. The circular and blue economy is about producing, consuming and regenerating in an endless creative spiral. 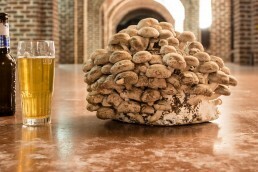 The young team of Le Champignon de Bruxelles has already experimented with growing different kinds of mushrooms on what was once seen as “waste”, for example coffee grounds and brewery waste. In this way, they recover the by-products of other industries and use them to grow mostly shiitakes. And even after the harvesting of the mushrooms, the substrates are excellent excellent resources. They can be used as fodder, or to be added to the soils of (urban) farms in Brussels. Also check out the best promo-video ever, made by Master Shiit and Shiitakid from the hip hop collective Pang! – 100% Bio. All of this sounds easy, yet we can asure that it is not. Starting an urban mushroom farm with waste products from the city holds many challenges. It’s hard to know where to start when talking about these amazing organisms. Fungi are by far the most undervalued organism on this planet. Most people only know them by their fruit, most farmers know them as pests, yet they hold so much more possibilities. These magnificent creatures have been used by humans for over 10.000 years as food and medicine. 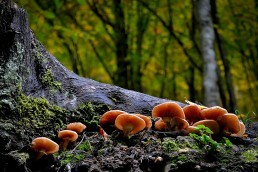 But probably the most unknown factor about mushrooms is their importance for this planet’s ecosystem. They are the creators of life and they are the network that connects life. And when it comes to farming them, it is important to know that they work in a completely different way than other organisms. To learn more about these wonderful organisms, check out the introduction to mushroom growing on Vertical Farming Academy. Shiitake (Lentinula edodes) is a very interesting mushroom. It is known because it is delicious and also because it’s so healthy, that it is being used as a medicin. About 90 percent of world production of shiitake’s comes from China and the traditional substrate for shiitakes is wood sawdust, mostly oak. 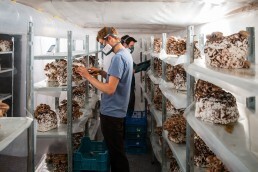 Le Champignon de Bruxelles chose the Shiitake for the above reason and instead of using traditional growing methods, they are looking to grow them on waste streams inside the city. This is a new art and science, so expect this to change and improve more in the future. KIKVORS will follow le Champignon de Bruxelles for sure. And we will do this by making a documentary once in a while. If you want to know the latest news go to their website and follow them on facebook.